Recorded on January 22, 2012. Pouches! Shoulder Pads! Big guns! 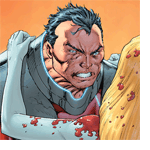 This week we become inadvertently topical as we review Robert Kirkman and Rob Liefeld’s The Infinite, Vol. 1. Which, as of this past weekend, will be the only volume. It’s been cancelled, folks. We talk about it and take some guesses why. It’s the Rob Liefeld based throw-down you’ve always wanted from us! We also talk about head injuries and Norman Rockwell Exhibits that are hotter than the hottest nightclubs, and I feel weird about that. I am kinda’ bummed that I missed out on the Leifeld theme for OK-Panic. I have like three ideas. Ah, Kurt, you shoulda done that for the redo week!